Only 3 more episodes of Game of Thrones left! 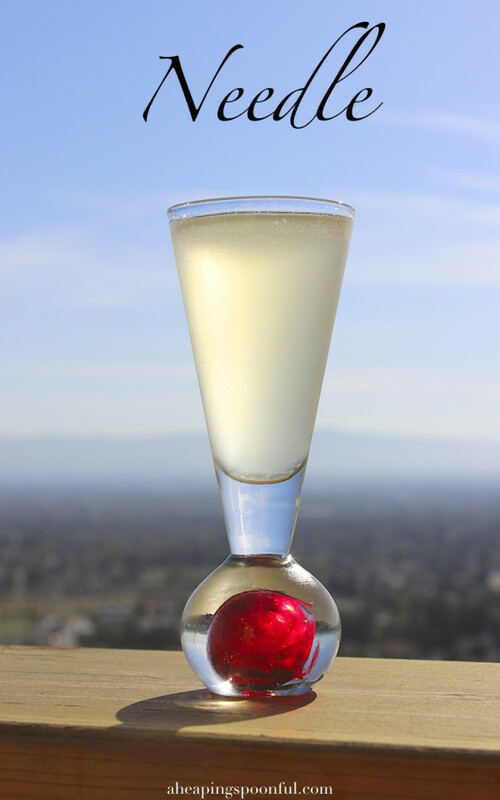 Perfect time to make theme cocktails for your GoT viewing party, or if you're watching the show solo and you just wanna treat yourself to something special. Even if you don't watch the show, you might still find a cocktail here that you like. I made 10 Game of Thrones cocktails (plus 5 more here) and there is a cocktail here for every taste, whether you like sweet, sour or just plain-old strong drinks. To help soak up all that booze, I also made a very Easy Game of Thrones Party Menu to go along with all these drinks. So you might as well have a cocktail, right? Pour white chocolate liqueur halfway up the glass. Fill the rest of the glass up with vanilla cream soda. 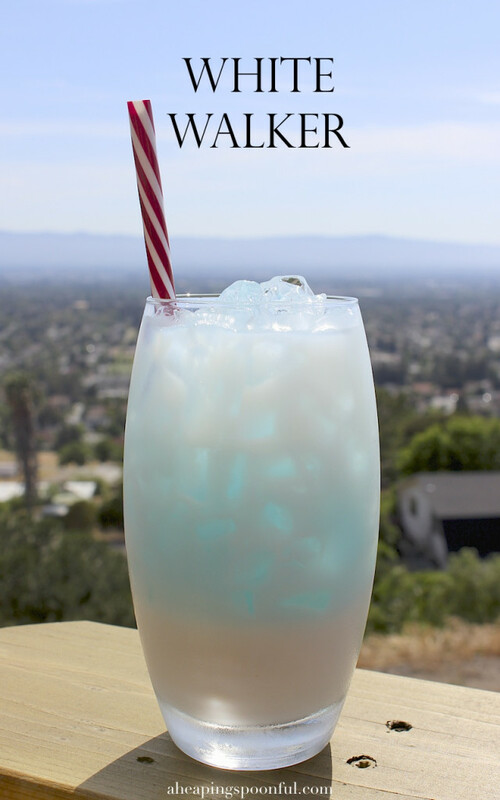 Slowly and gently pour a spoonful of blue curaçao over the top (drink should look layered: light blue on top with white below). I recommend enjoying this cocktail with a straw. Place a scoopful of ice in a cocktail shaker (or in a large glass). Pour all the ingredients into a shaker and shake (or into a glass and stir). 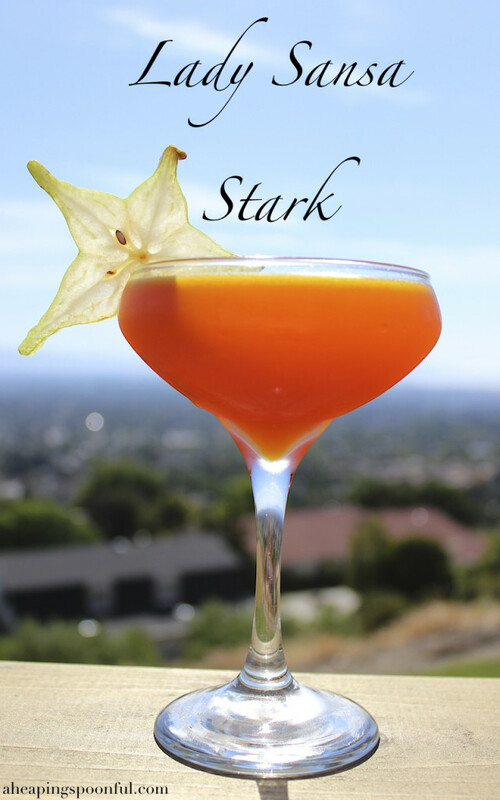 Pour into a coupe or martini glass and garnish with a slice of starfruit (Sansa "Star"-k, get it? I used my lemongrass syrup because we all know how much Sansa loves her lemon cakes). Pour some ice into a short glass (old-fashioned). 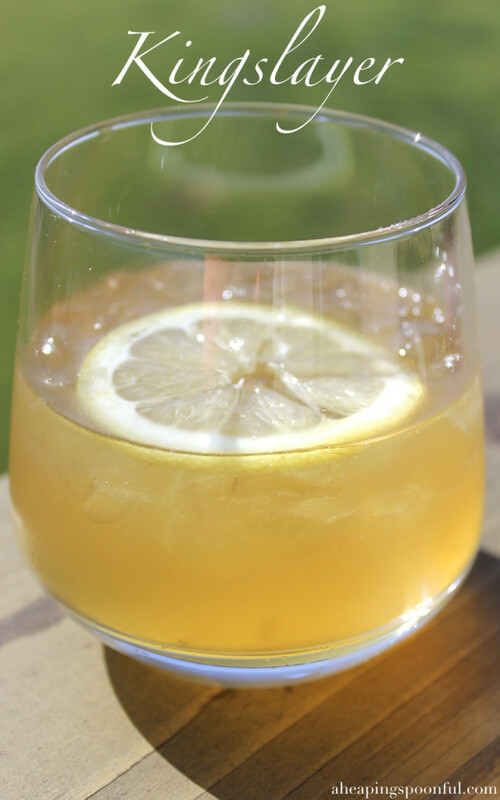 Garnish by dropping a thin lemon slice into the glass, it should float. In a wine glass add a few cubes of ice and some of the berries. Rub a lemon onto the rim of a shot glass. 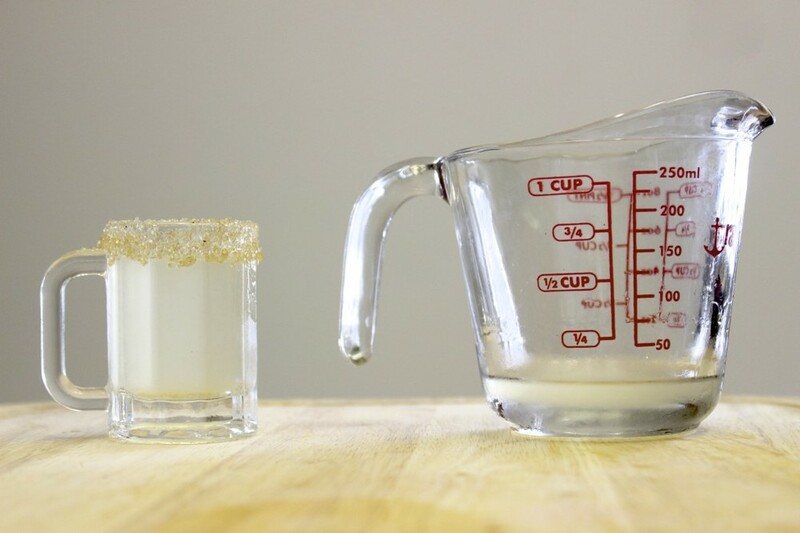 Dip the shot glass into some sugar to create a sugar-rim. In a separate glass, add all the ingredients and stir. I used a mini shot glass sized beer mug, which seemed perfect for The Imp. 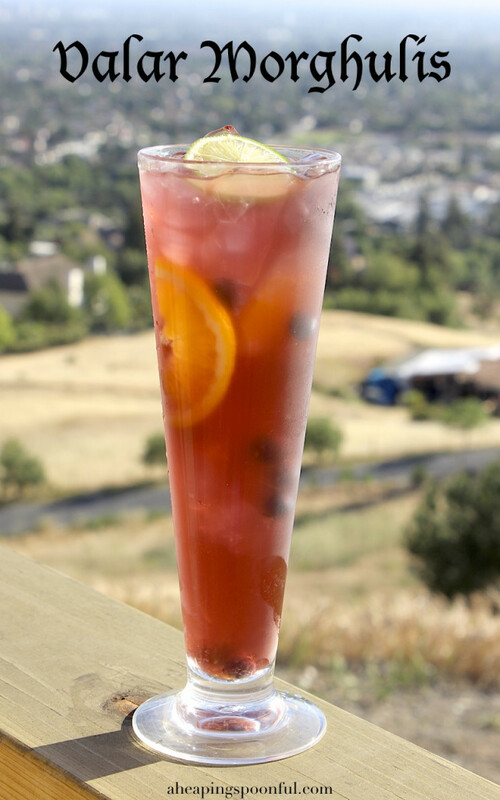 Pour ice into a tall glass and add the blackberries. Pour the Chambord over the ice. Top it off with Guinness. Scoop the balls of dragon fruit out and place them in a champagne flute. Pour all the chilled ingredients into a cordial glass and drop the small orange slice into the glass for garnish. Add the tequila, grenadine, blue curaçao and lime juice. Top off with club soda and add the fruits for garnish. Stir everything together, the drink should be purple, but not so dark that the blueberries are not visible. That's why a tall glass helps. 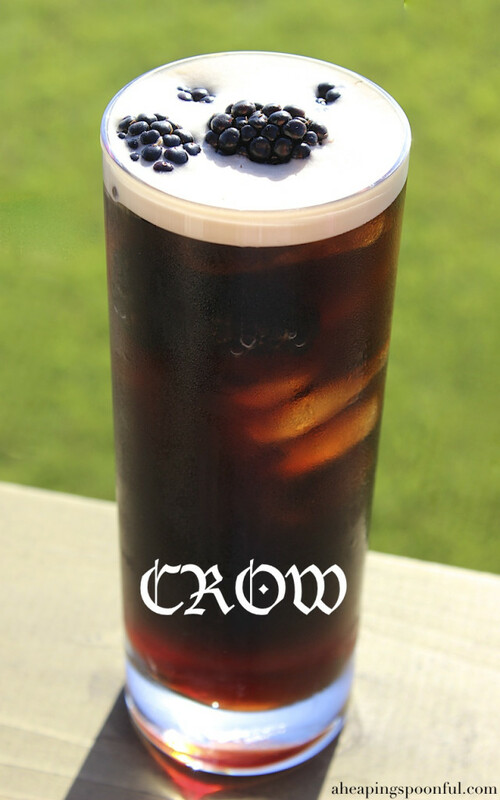 So, I hope you enjoyed at least one of the 10 Game of Thrones cocktails. For more fun recipes subscribe to my blog. You will get no spam from me. I swear it, by the old gods and the new.